At the moment, the yellow-rumped warbler is by far the most abundant warbler in Iowa, and probably throughout the Midwest. They're everywhere! 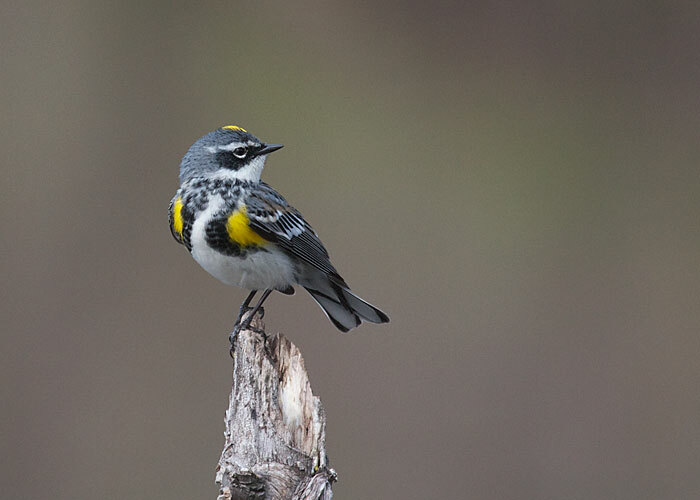 May is best time to see migrating warblers in the Midwest. Most will keep going north, to nest. If you want to see them, you gotta look now. They're at their peak, and very soon they'll be gone. This flashy fellow posed for me at Big Woods Lake Recreation Area, in Cedar Falls, Iowa, today, during the semiannual Iowa Ornithologists Union convention. Thayer Birding Software's Gold Edition DVD is the ultimate resource for bird information. Use it on your PC computer and enjoy photographs from world-class nature photographers along with songs, sonograms, action videos and detailed range maps.